What does the #MeToo movement mean to you? What do ancient Jewish wisdom, and current legislation, have to say? What have we accepted in the past that we will no longer tolerate; and what can we do to empower, support, and protect ourselves and our loved ones? Join us for an evening of listening and learning on March 26. 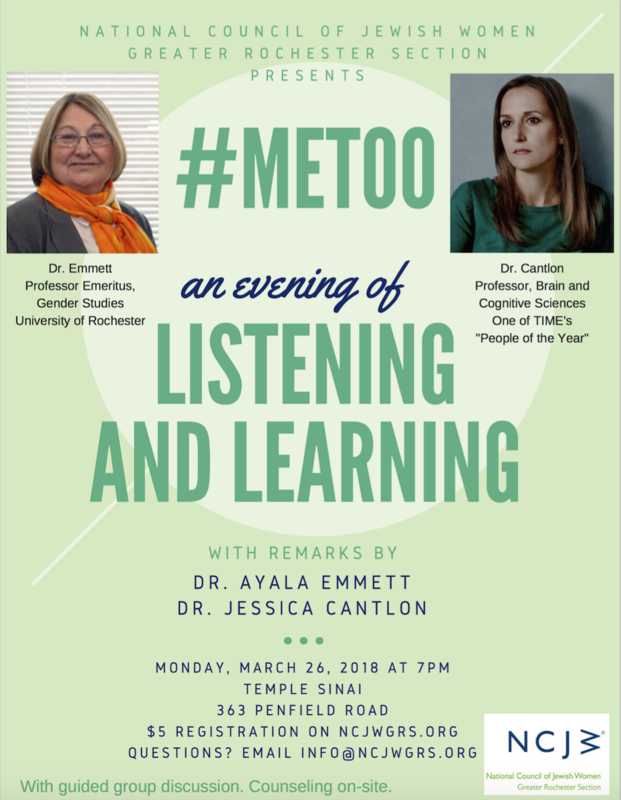 We will hear remarks from Dr. Ayala Emmett, Professor Emeritus of Gender Studies at University of Rochester; and Dr. Jessica Cantlon, the professor at University of Rochester who joined colleagues in filing a complaint with the EEOC to protest sexual harassment in her department. Dr. Cantlon was recognized by TIME magazine as one of its “People of the Year.” Guided small-group discussion will follow, with counselors available throughout the evening. Reserve your spot for $5.